SEOUL, Jan. 31 (Yonhap) — For many South Korean TV drama viewers, the combination of two veteran actors — Kim Nam-joo and Ji Jin-hee — as a problematic married couple could be appealing enough for them to sit and watch their new series. “This script is exactly the one I have been waiting for,” Kim said at a press conference to promote the series in Seoul on Wednesday. The actress was frank about how much she sympathized with the character. The romantic thriller revolves around popular anchorwoman Go, who does whatever it takes to maintain her fame and success. But her life begins a downward spiral after she is named a person of interest in a murder case. 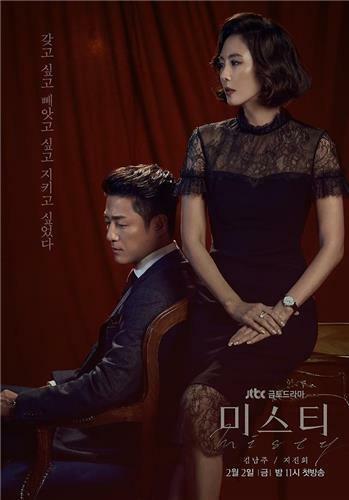 Her husband, Kang Tae-wook, played by Ji Jin-hee, the star of the popular period drama “Jewel in the Palace,” comes to her rescue by defending her as her lawyer. The actor is expected to play a faithful husband with unconditional love — the kind of character he is best known for. Producer Mo Wan-il said the names of the two actors naturally came up while he was discussing the potential cast with the scriptwriter. “It was a very rare experience that we named the same two actors simultaneously. It was as if the writer wrote the story while having them already in mind,” he said. Go is a self-made career woman who has been in the most sought-after position at a network for seven years. She married public defender Kang who is from an influential family. Outwardly she looks confident and self-assured, with fame, money and a happy family. But in reality, she is constantly on edge and fearful of losing things she has achieved. “As the title ‘Misty’ suggests, the drama looks into the truth of life shrouded in uncertainty. The cast members are really doing their best to tell the real story and feelings as sincerely as possible,” the producer said.